4.G4 makes the vibration intensity and vibration frequency adjustment becomes reality. Press Clear + Up/Down button of the D-pad to choose the higher/lower vibration frequency. 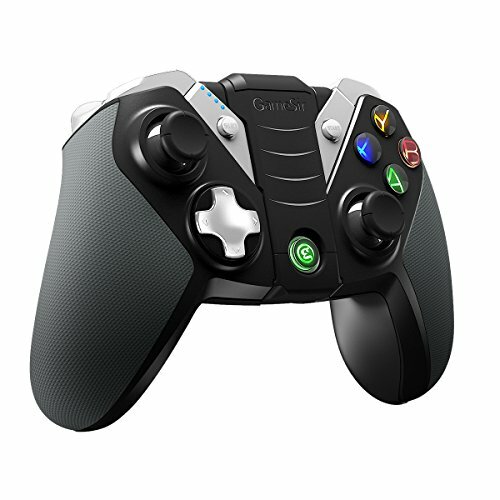 5.G4 also features changeable position of D-pad. Press Clear+L3 to exchange the position of left joystick and D-pad. Play the games in the way you like. ✔ Built-in Bracket - with two adjustable angles (Multi-Angle, 110 degrees & 150 degrees) can be used as an individual mobile holder for 3.5~6-inch smart phones. ✔ Ergonomic Design with Top-toughened Materials - Analogue sticks have 360-degree positioning with ultra-accuracy. The button life is more than 2 million times. The trigger adopts of metallic design, with dazzling shape, avoid slippery when sweating. ✔ Realistic Vibration - Changeable position of D-pad & the left joysticks, Play the games in the way you like. Adjustable vibration intensity allows you to have a real feedback in different scenes of games. ✔ Long Battery Life - Chargeable battery can last 10 hours for Max Power while 30 hours for Min Power, stand-by time can last at least 12 months.